It goes without saying that making decisions is stressful. And when it comes to choosing an eCommerce platform for your online store, everything is even more elusive. Fortunately or not, digital industry is a “boundless ocean” that is spoilt for choice where countless options are literally bombarding you with ads and benefits from every possible angle. How to recognize your ideal shopping cart among tons of best suitable solutions? Don't expect to receive a straight and immediate answer but be 100% sure that the time you put into digging up will be rewarded. You probably know that first impression is often deceiving. The same can go with selecting an eCommerce platform. Before making the final decision, it`s important to consciously understand your needs, goals, and opportunities without jumping into hasty conclusions. Not sure where to start? Here is the digest of questions you should be asking yourself, I would say it is a MUST for consideration, before getting on the track of business development. This one of critical points that has to be disclosed primary. Is your store going to be small, medium or big one? How large is your inventory? Imagine that your business is a cobweb where everything is interconnected and interdependent. One wrong move and all your efforts may collapse. What would you do to avoid problems? First, you'll choose an eCommerce platform that handles number of items you set up for sale and what`s more preferably will not charge by how many products you list. Some shopping carts put their limits on the permitted amount of products. It concerns hosted engines that restrict the number of items in basic plans. If the limit is exceeded, you'll need to pay extra fees. How much control over your store you desire? When you`re picking an eCommerce platform, the following dilemma may cross your mind: open-source or self-hosted shopping cart? What I can surely say is that the answer depends to a great extent on the level of your tech skills. If you`re a tech savvy who wants to run the store your way or have a workforce of IT guys who are ready to devote much time to website development, an open-source is a way to choose. A versatile customization, access to code and flexibility is a huge plus if use it wisely. If you want all at once, in a short period and don't see the need of having a code-level control over your e-store - hosted solution will be a good fit. With such eCommerce platform, you don't need to worry about the server settings, platform setup, SSL certificate, etc. Also, you can benefit from 24/7 help desk that almost all hosted solutions may be proud of. Is SEO important to you? Though SEO is vital, not every online store owner considers it to be a decisive criterion. In the highly competitive niches, lots of retailers instead of promoting their products organically, tend to use PPC ( Pay-per-click). But if you want to focus on SEO, numerous strategies will help you to optimize your site to the level of perfection. For newbies here, a successful SEO implementation is when your site is visible to search engines ( preferably is situated in the first ten positions of SERP) and people when they try to find some products. That`s why it's crucial for your platform to offer you the ability to edit title tags, meta descriptions, pages URLs, images ALT tags, customizable image file names, etc. Don't forget to do a profound research whether the shopping cart offers additional modules and apps that improve SEO of your website. The top ones are Yoast, Squirrly, Simple 301 redirects, etc. It`s clear as a day that appearance of your e-store plays a paramount role in gaining more customers and in result driving more sales. Does the eCommerce shopping cart offer beautiful yet flexible templates? Will your site be user-friendly and easy to navigate causing no bad influence on your clients` shopping experience? 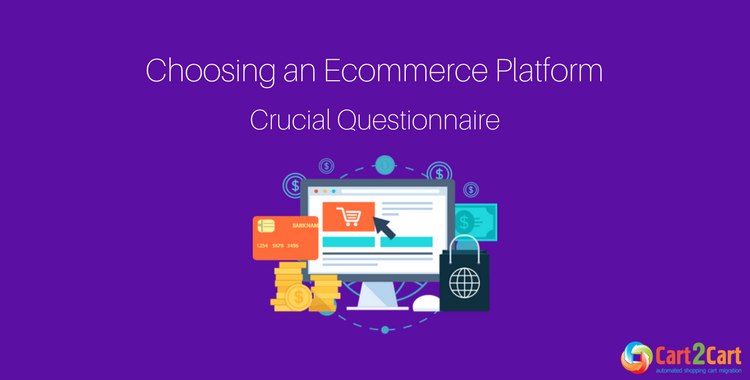 To answer these questions, browse the themes the eCommerce platforms offer. Keep in mind that your site has to be brightly designed and help your potential customers to navigate through it effortlessly and smoothly. It`s awesome if you can customize the theme making it more appealing to search engines. Delve it deeper. See if the platform includes only a generic design or has a great variety of additional options. Usually, eCommerce engines provide the users with free and paid options depending on your needs and tastes. However, don't forget to learn your audience beforehand. If focusing on the youth market, you'll need the e-platform with maximum emphasis on design. If you sell household products or work on B2B market, you may sacrifice design in favor of other features. Are you sure out of the box functionality will be enough? If not (and you shouldn't be) - an extensive app store is a must. Isn't it amazing when the necessary extensions, modules, plugins you need are gathered in one place? And isn't it wonderful if your eCommerce shopping cart already offers them? Before choosing an eCommerce platform, check out whether it has the necessary add-ons that will help you to meet your needs. Luckily, the list of them is vast, determine and focus on the main goals of your business and just start taking advantage of it. Do you plan to go multi channel? Multi channel retail is vital for today`s business and is perhaps one of simplest ways to make your online store recognizable in market. It`s a powerful way to gain an effective customers` flow and boost conversion rates. You'll win doubles or even trebles if your eCommerce platform integrates with marketplaces like Amazon, Ebay that are a starting point for over 45% customers or social medias: Facebook, Instagram, etc. How do you expect your client to pay? This is an essential fact to take into account when selecting an eCommerce platform. Check whether the payments option your shopping carts offer suit both local and international audience. With the help of such approach, you`ll ensure your customers a convenient shopping experience and drive worldwide traffic to your website. The top popular gateways are PayPal, Authorize.net, Stripe, 2CheckOut. Many of eCommerce engines offer them by default whereas lots give them as additional extensions. The best eCommerce platform is an affordable eCommerce platform! Do a deep research on how much you are going to pay. Whether it takes from you a small percentage per sale or it works with monthly pricing plans? You should bear in mind that often a free open-source solution eventually may cost you more than a paid hosted one. Everything depends on your targets. What happens if you need help? Problems are the inevitable part of our living. That`s OK to make mistakes; the important thing is that how quickly and efficiently you're going to solve them. If an emergency occurs, will be there someone who will lend you a hand? A sufficient tech support cannot be unuseful. Many hosted eCommerce engines offer 24/7 assistance to their clients which can not be underestimated. Many solutions provide it only for extra fees. Meanwhile, many do not have day and night assistance. Instead, they can be proud of global forums with millions of active users where the answers are solved in a mouse click. To simplify your decision making, we prepared for you the list of top shopping carts that best correspond to the above questionnaire. These are: WooCommerce, Shopify and Magento. WooCommerce is one of worldly respected eCommerce solution that best suits small and medium size businesses. It`s an open-source eCommerce plugin that seamlessly integrates with WordPress, a dominant website, and blogging content management system. It is a worthy solution for those merchants who wish to build their web store from scratch, benefiting from WordPress's lightweightness, fast speed, and awesome blogging functionality. Based on Similar Tech research results, WooCommerce is installed on nearly 827,197 unique domains. WooCommerce is a user-friendly platform with an intuitive and powerful interface. If you belong to those with some tech skills or have a team of dedicated IT developers, you'll enjoy it to the fullest. Being an open-source engine, code access and high-level customization is all yours. You are one who takes control over your store! Before start working with WooCommerce itself, you'll need to handle a couple of things. One of them is the installation and configuration of the plugin. However, no worries here, WooCommerce took care of everything beforehand and as a result will lend you a hand through five installation steps to activate and configure the plugin accurately and properly. Another strong point of WooCommerce is SEO-responsiveness. Thanks to WordPress compatibility, you can take advantage of piles of offered third-party plugins and extensions that take SEO potential to the highest level. The most popular is already mentioned Yoast SEO that is responsible for optimizing your website to an advanced level. WooCommerce is full of attention-grabbing, inspirational templates that can be beneficially used in dressing up your e-store. At the moment, it has one official store theme called Storefront, hundreds of attractive designs in WordPress directory and over 1000 templates in ThemeForest. All your themes can be adjusted and coded to tailor the look and functionality of your site. You can customize them with the help of plugins like Jetpack, Code Snippets which will allow you to apply minor changes or buy a Child Theme and do major ones. WooCommerce can boast of mobile-ready templates. One of them is MobileStore theme that was primarily designed to boost your mobile sales and offer visitors a pleasant browsing experience. WooCommerce can be proud of its Extension Store that is structurally subdivided into various categories: from marketing tools to shipping, payments, store management extensions. Just pick up the one of few that suit your needs and expand your business to new heights. Using WooCommerce, you can ensure your e-store an advanced recognition and gain traffic from popular marketplaces: Amazon, eBay. To do that, you'll need to install WP-Lister Lite for Amazon and WP-Lister Lite for eBay plugins that are free to download and use. From the moment the plugins are downloaded and activated, you can list any number of items to the global marketplaces and enjoy the extreme flow of new revenue. WooCommerce works with multiple payment gateways allowing the customers to be 100% sure of its secureness and reliability. This eCommerce platform puts no boundaries on the location as it works with international gateways as PayPal, Stripe, Amazon Pay, Authorize.Net, etc. WooCommerce provides tech support via WooCommerce Account/Dashboard for extra costs. However, it's not always necessary because with this eCommerce provider you gain access to world-wide community and become a part of various active WordPress forums. Thanks to active users and helpful Woo developers, you can solve the problem in a flash. There are many FAQs and guided tour videos available in a profound WooCommerce documentation. Transfer data to WooCommerce and reach a greater heights now! The next representative of our discussion is Shopify. In comparison to WooCommerce, this is a self-hosted solution meaning that everything from installation & setup to store management will be not your issue. It`s true that comparatively to open-source engines, Shopify offers relatively low customization options. However, it has never been a hurdle for this platform to become one of the world`s leading solutions serving 310,304 of merchants across the world (Built With stats). Shopify is an ideal choice for retailers who need a quick and smooth store setup where even the newbies can feel at ease. Thanks to Shopify's drag-and-drop interface, simple tools and effortless theme editing, it nowadays became one of the most user-friendly platforms. Shopify offers to its clients a stylish yet easy to comprehend Admin Panel that is a hard act to follow for many of eCommerce solutions. You don't need to be a tech savvy to set up your store. Just login to your Shopify admin, add and organize your products, menu and links to your site and start selling online. With only few tweaks to your Shopify e-store, you can significantly enhance your visibility and increase sale. With this eCommerce engine, you can optimize meta descriptions, headings (H1s, H2s, etc. ), images (file name, alt text, and image size), edit keywords for a particular page in the title and H1, etc. Also, you may install additional SEO plugins, for eg. SEO Manager that will improve your Google ranking appearance and give paramount control over your site's SEO. A huge hallmark of Shopify is the wide-ranging templates appealing to various tastes. It includes a big variety of super-professional, attractive templates that suit to any devices. You can have a look at them at a large Shopify's theme store and find your perfect design. Currently, there are 9 Free website templates and the cost for paid ones ranges from 140$ to 180$. Like WooCommerce, Shopify has its own app store offering piles of advanced extensions to your store. All the tools are divided into categories and are targeted at improving various aims and needs: marketing, inventory, customer service, accounting, social media, etc. Many of extensions you can find costless that can not be left unnoticed, of course. One of the highly appreciated Shopify`s strengths is that it constantly grows its sales hub strategy allowing the online store owners to integrate with multiple marketplaces and social media channels:Amazon, eBay, Facebook, Pinterest. We cannot but mention Shopify`s popular Buy Button allowing you to list your products on any WordPress site. What's more, there is a beneficial POS application that allows you to accept payments from pop up shops, markets, in-stores directly from Apple and Android devices. Lots of praises to Shopify's Google Shopping app that synchronizes your store with Google merchant center. Shopify works with over 70 payment gateways: PayPal ( provided by default), Authorize.Net, Stripe, etc. Shopify offers to the clients 24/7 support that is reachable via email, phone or live chat. Apart from this, you can benefit from its helpful tutorials and guides available on the website. Shopify offers a free 14-day trial allowing the merchants to test out the service before getting to work with it. After that, you'll need to purchase a monthly subscription. There are 3 pricing plans: Basic (29$), Shopify (79$) and Advanced Shopify (299$). Also, you'll need to pay transaction fees ( 2.9% - 2.4%) when using any other gateway except Shopify payments. Migrate to Shopify painlessly and securely! Magento is another powerful, versatile eCommerce engine that opens new horizons with unlimited capabilities to every tech savvy. It`s a worthy solution for medium or big size businesses targeted at the extensive audience and huge sales. Magento is an open-source engine that includes an incomparable set of effective eCommerce features along with boundless multichannel capabilities. If you posses a high level of tech expertise ready to sacrifice your budget into your store development, Magento is your way to go. Far not all shopping carts can boast of such extended plug-in architecture. With a code level access and considerable programing knowledge, you're able to give your store a super-professional look. Thanks to its top-notch functionality and piles of offered of options, you can build the e-store of your dreams. Magento unlike WooCommerce and Shopify, is not so user-friendly platform. Even the daily activities often cause lots of troubles to online store owners. However, if digging into the code and tech challenges is your thing, you can feel the merits of its powerful solution. Magento is incompatible in SEO. This is the reason why it has 100 scores out of 100 according to ecommerce-platforms.com research. With this eCommerce provider, you can customize every area you want and optimize your site to an unparalleled extent. It has hundreds of out of the box SEO features: products and categories canonical tags, products & home page meta tags, images optimization, edits of robot.txt files, etc. What's more, you can find many SEO plugins in its extensive marketplace that improve your visibility in SERP and ensure top-notch optimization to your store. If you want to give your store a unique style and look, Magento is a perfect decision. Many of themes you can find in Magento Connect + a big variety of them are available in ThemeForest. For today, there are over 120 costless templates on Magento Connect. The prices for paid themes won't shock you either. On average the costs are $80-$100. The same as WooCommerce and Shopify, Magento offers multi channel functionality to its users. To integrate your store with Amazon and eBay, you'll need to install the M2E extension. After that, you can list your products and greet your new customers. The same as Shopify, Magento allows you to add your products to Google shopping listings with the help of Simple Google Shopping extension. Magento guarantees your customers an enjoyable shopping experience and will cause no hassle with credit card payments. Like Shopify and WooCommerce, it supports multiple secure payment gateways putting no borders to the audience either it`s local or international. As nearly all open-source platforms, Magento does not offer 24/7 support, however, can be proud of profound documentation and worldwide developer community. Being a part of Magento Forums means that all your questions are already answered. What`s worth mentioning is that Magento provides special free and paid educational courses, gives video tutorials and guides to its clients. In terms of pricing, Magento comes with 2 options: Magento CE (Community Edition) that is free for download and use and Magento EE (Enterprise Edition) where the price depends on your business revenue. Taking into account that most of the plugins are available for additional costs, it won't be cheap to run your store with Magento. However, you should know that our money won't be spent in vain. With this provider, you can take your store to a new level. Move data to Magento and enjoy its superiority to the fullest! What's the takeaway from our discussion? Choosing an eCommerce platform is difficult and time-consuming We can`t say you which shopping cart is the best pick, because all your targets, needs, and opportunities are individual. All we can do is to provide you with some ideas and examples of worthy solutions, but the choice is up to you. But if you already have an e-store and feel that it doesn`t correspond with your needs, Cart2Cart will be happy to help you! Cart2Cart is world`s leading shopping cart migration service that is called to make an eCommerce switch easier. With over 45 000 of successful data transfers, it`ll move your store to mentioned above solutions or 77 other shopping carts securely and smoothly. Benefit from its effortless 3 step migration, widest range of transferable entities, amazing speed. If tech issues occur, feel free to get in touch with our dedicated 24/7 support team. Start a Free Demo migration to any of 80 eCommerce providers and enjoy the prosperity of your business along with Cart2Cart!